One more trip with two of their three daughters, ages 7 and 16 at the time, clinched it and the family took a leap of faith, voting to build their second home in Tahoe with the idea that the wife would be able to design her vision for the house. After touring several smaller lots, the couple hit on the ideal site: A more expansive lot on Martis Camp’s Benvenuto Court, with incredible views of Northstar’s Lookout Mountain and the Carson Range. After much deliberation over a Tahoe versus L.A. architect, the couple opted for a Southern California designer, which proved to be a good decision as they ended up meeting almost weekly during the planning process. However, after multiple interviews, the couple still hadn’t found a perfect fit, but Ron Radziner of Los Angeles design-build practice Marmol Radziner sat on the board of their children’s school. The couple liked not only Radziner’s clean lines and uncomplicated contemporary architecture, but also his team’s professionalism and the firm’s creative and comfortable atmosphere. 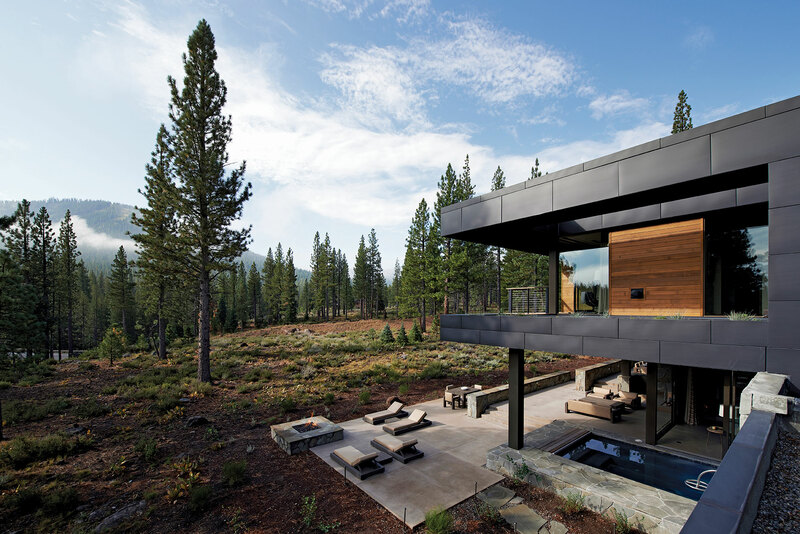 Radziner was excited for the project, a ski house in Tahoe. The larger lot allowed Radziner to design the property with its largest entrances, private spaces and views facing south, away from the street and into the forest. 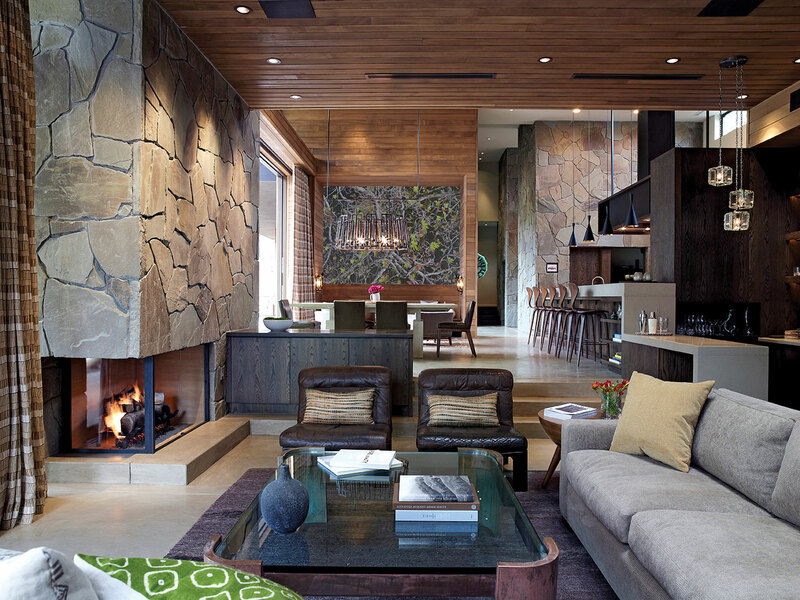 Not only did the building materials create that organic, mountain-meets-contemporary feeling the couple desired, but many of the unique vintage or unusual pieces the wife and designer Kim Alexandriuk found for the home created more warmth and character in each space. Soft, neutral-tone floor-to-ceiling draperies hang in the bedroom, living and dining rooms, creating more privacy and warmth. New and vintage light fixtures, artworks and unique furniture—some hand-crafted specifically for the home and some purchased at various antique shops, design stores, galleries or flea markets—appear throughout the house, creating charming and comfortable-yet-polished areas. The design and use of unifying materials create consistency from room to room. 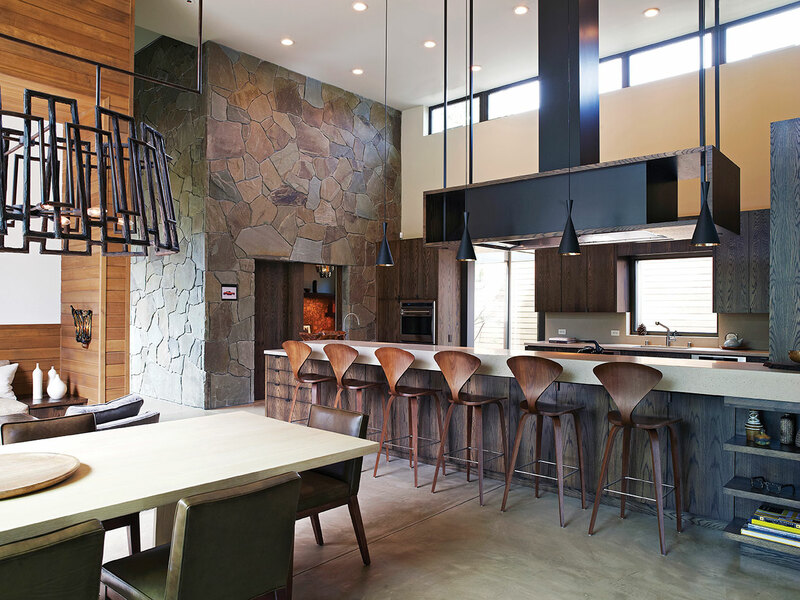 Zinc and wood, matchstick paneling and Pennsylvania bluestone, hand-culled by the couple and the design firm, run from interior to exterior to create a feeling of uniformity and harmony. “Ron doesn’t overdo it on materials, and he has a great way of wrapping the materials indoors and outdoors,” says the husband. “You can see the zinc kind of comes in and outside of the house in certain places, so does the stone; even at the front door, the wood is inside and outside.” Another example is the living room’s wooden ceiling, which continues outdoors in one uninterrupted stretch. At the end of the hall is an incredibly functional bathroom featuring double showers with changing rooms, double toilets and double sinks. Rather than floor-to-ceiling doors, Radziner suggested shortened doors with open space at the bottom, in the style of camp stalls. 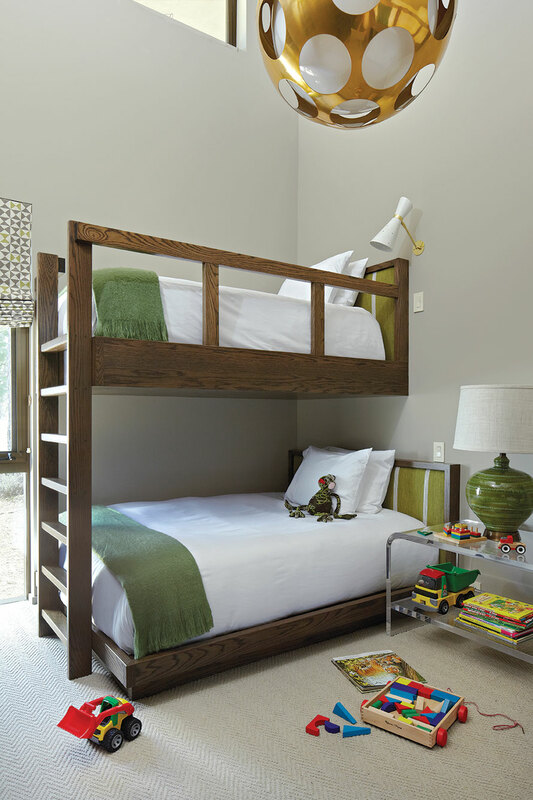 The camp theme continues into the two mirroring bedrooms each on opposite sides of the hall: double bunk beds cantilevered out of the wall, matchbook paneling and a separate set of drawers, shelves and closet space for each bunk. Between the bunks in each room hangs a print by artist Tim Bavington, who is known for plotting music visually using a different color assigned to each note. The couple wanted the home to be a place for family time and togetherness in common living areas. Thus, the three bedroom suites (designed with their three daughters in mind) are cozy rather than expansive. In each of the two smaller bedrooms, one gets incredible views of the mountains; each bath features floor-to-ceiling marble and a sunken tub (“almost like a Zen soaking tub,” notes the wife) looking out onto the same private landscape. In the dining room, a video installation art piece plays on a loop behind a built-in couch, projected through the custom split chandelier hanging above the dining table. In the summertime, floor-to-ceiling sliders open up so the family can have an indoor/outdoor dining experience. In the kitchen, poured concrete counters with small flecks of brown create a unified color palette with the concrete floors and a section of butcher-block countertop. Modern, iconic bar stools and light fixtures at the bar lend an aesthetically sleek appearance. Skylights, another feature appearing throughout, and radiant heat give light and warmth to these rooms, despite the tall ceilings meant to accommodate the spectacular view. Through the kitchen, a glass hallway (with an unbeatable Carson Range view) leads to lockers and a mudroom, a laundry room, an extra bedroom and the garage. The all-white rooms are adorned with colorful original artworks drawn or painted by the couple’s 11-year-old daughter. On the other side of the kitchen, down a few steps, is the living room. Double TVs, back to back for dining-and-living-room entertainment, are hidden from sight inside a cabinet but rise to viewing position at the touch of a button. But there’s something better than TV here, of course. Radziner’s firm uses 3D modeling—even modeling in the surrounding mountains and other landmarks—to take the guesswork out of the design process, so every view is exact. From the large, welcoming V-shaped couch in the living room, the perceptive observer will notice the roofline only extends to the space barely above the top of Lookout Mountain, framing it perfectly within the floor-to-ceiling glass sliders. Just outside sits a tile-and-concrete sunken spa pool that holds 20 or so people, and beyond that are an outdoor shower and bathroom, plus a fire pit for summertime entertaining on the patio. A wet bar and glass wine room, inspired by actress Jennifer Aniston’s own wine storage, showcase the couple’s collection of handmade iron bottle holders protruding from the stone wall, which in true Radziner fashion extends past the glass case to become the backsplash and wall behind the sink. Another eclectic find, the square glass fixtures over the bar evoke ice cubes. In keeping with the theme of companionship, the husband’s office sits with its entrance to the living room, almost like a separate square box placed right in the middle of the action, with unique wood paneling used nowhere else in the home. Another tall skylight gives the feeling of spaciousness, while corkboard walls behind wooden shelves and a small bathroom with a stone basin and wallpaper made of tree bark with silver details lend a pleasant richness of tone and texture. A small scale model of the home—a birthday gift from a friend—sits on one of the office shelves. Seeing it on a smaller scale emphasizes just how many different layers there are to the structure. A sculpture of a deer made from a reconfigured loveseat is right at home next to the giant wall of glass; it looks almost as if it’s standing outside as reflections from the outdoor spa play through the windows and onto the wooden walls. Indeed, the room, its deck and the adjoining master bath all face that sun-soaked forest and ski hill. Mahogany travertine, more bluestone and rich wood paneling on the cupboards give the bathroom a luxurious feeling, as does the tub with its glorious outdoor view and the living roof sown with wild meadow grass. The family has begun spending many weekends and weeks at a time on school vacations in their mountain getaway. Since the house’s completion in 2011, the wife has taken up golf and skiing, and their 11-year-old joined the Northstar ski team. On entering the house, the first thing a visitor sets eyes upon is a painting, hanging just inside the front door in the foyer. The first piece of art the couple purchased for their new home is possibly the most fitting thematic declaration: an oil and acrylic painting on wood by Kim Dorland, called Meeting Place.